It was my mom's birthday last week, and she had two simple requests for us: first, that all of her children (my four siblings and I) would come to her house for dinner, and second, that she wouldn't have to cook that dinner herself. My older brother organized things and assigned everyone to bring something. My younger sister and her husband made an amazing lasagna, my younger brother brought drinks, my littlest sister brought hummus, and I brought a chicken veggie pizza (which I'll share with you this week) and these angel food cupcakes. My mom has always loved angel food, but I don't have a tube pan, so cupcakes were the way to go. It was my first time making any sort of angel food, and it turned out great! I love the combination of light, airy cake with sweet whipped cream. And using the Kitchenaid made the whole process incredibly fast (you don't even want to know how long it took me to beat the egg whites for this lemon pudding by hand... I thought my arm was going to fall off!). I have to admit, I was a little intimidated by angel food cake, but these were easy to make, and turned out perfect! 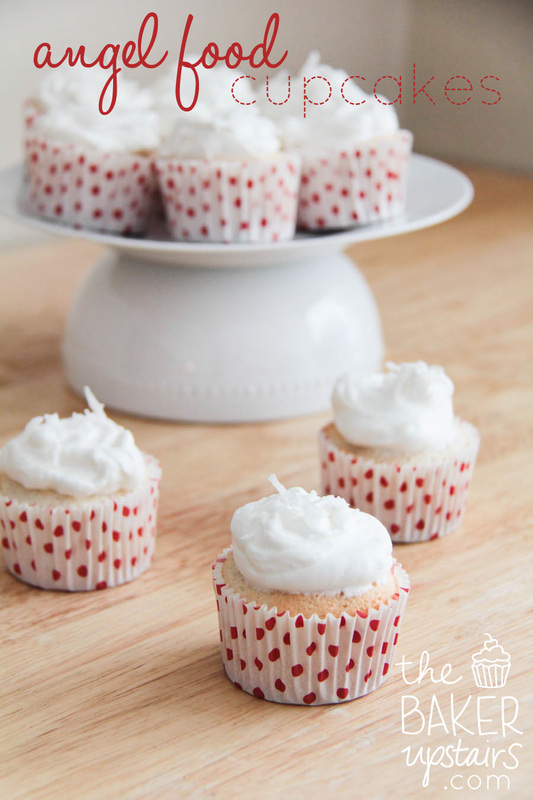 Preheat your oven to 350º and prepare 2 cupcake pans with paper liners. In a small bowl, combine the flour and sugars, set aside. In the bowl of your stand mixer whip the egg whites for one minute, until frothy. Add the cream of tartar, vanilla and salt, and whip for 5-6 minutes until stiff peaks form. Sprinkle 1/4 c of the flour mixture over the egg mixture and fold in gently, repeating until all the flour is incorporated. Spoon the batter into the paper liners and bake for 15-17 minutes, until lightly golden and springy to the touch. Remove from the oven and cool completely in the pans. Freeze the bowl and whipping attachment of your stand mixer for 10-15 minutes. Add the heavy whipping cream, vanilla and sugar to the bowl and whip for 3-4 minutes, until light and airy. Frost the cupcakes, and refrigerate leftover frosting immediately. I just wanted to say thanks for choosing my recipe to celebrate your mom's birthday, I hope you all enjoyed them! We loved them! And I just adore your blog... everything I've tried of yours has been great! Umm... how did I not find your blog earlier?! Thank heaven for Pinterest. Your recipes look amazing—can't wait to try some of the cupcakes. Gotta love Kitchenaids! :) These sound awesome; I LOVE angel food cake! I think I need to try my hand at angel food cake again...and with this recipe! I just made these this afternoon... they came out pretty great and weren't too hard to make. The frosting was a little sweet for my taste buds but I think this cake would be perfect to use for stawberry shortcake. When do you add the granulated sugar? Oops! It's supposed to be mixed in the small bowl with the flour and powdered sugar. I've updated the recipe! Do you have to refrigerate until you are ready to serve these? I am taking them with me to a party and they could be sitting out for awhile. I made these tonight for strawberry shortcake and WOW!! So good, thanks! Do they come out fine without flipping them over like a normal angel food cake?? ?